In the novel “Shantaram” the main character Lin explains that at times in India you have to learn to surrender. Surrender to the country itself, surrender to people and the place, just give in and go along with the flow. The first time I experienced the feeling of having to “surrender” to India was when I visited the crowded Mahalaxmi Temple in downtown Bombay. A rush of visitors to the temple were queued up, waiting to reach the shrine. The ‘queue’ was not so much a line… it was more a rowdy pack of people jockeying for a place at the front. I had no choice but to be thrust forward with a sea of dozens of Indian ladies pushing their way up (at this temple, there are separate lines for men and ladies). I just smiled and surrendered, allowing myself to surge forward with the crowd. 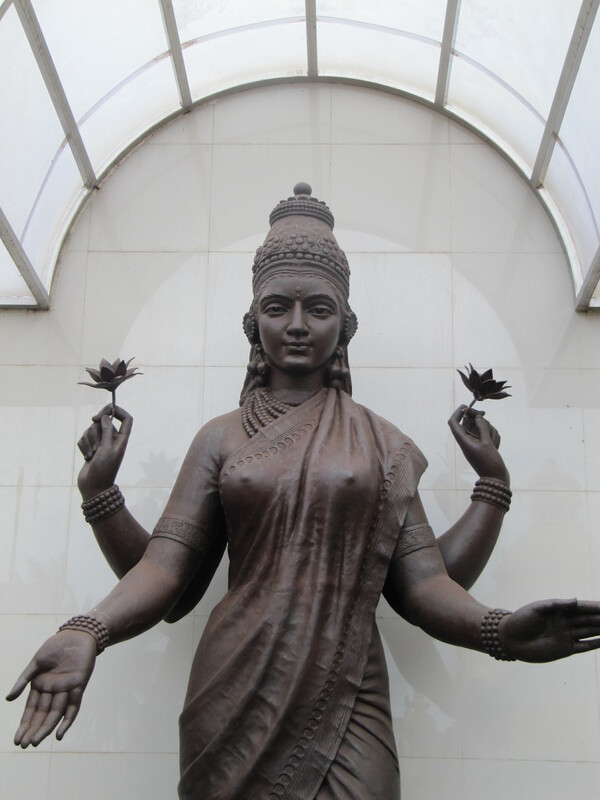 A Hindu goddess holding lotus flowers at at temple near Goa, India. 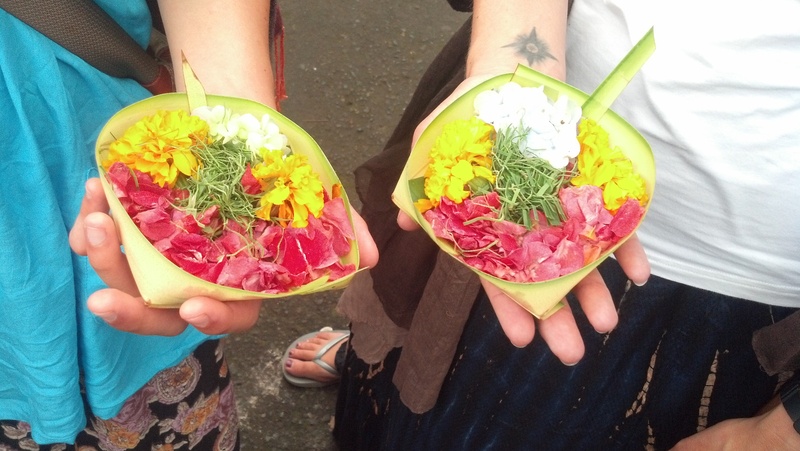 Once at the shrine, ladies handed (shoved is probably more accurate) their offerings of flowers, coconuts and fruit over to the priests to be blessed before the presiding god with a prayer. The priest then returns the offerings and other presents back to the people. I admittedly knew almost nothing about the Hindu religion before traveling to India. 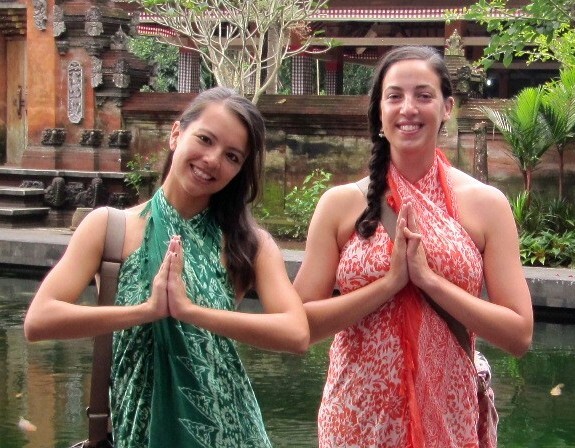 I quickly became fascinated with the beautiful temples and rich, colorful practices of Hinduism. Every small detail and action has some sort of meaning. Throughout my travels, I’ve visited many sacred Hindu places and I’ve more or less received a crash course in the religion. So there are more than 300 million Hindu deities, and each male god has a female counterpart. A lot of the female gods are pretty badass too, often yielding knives, swords and spears in the various tapestries and wall paintings. The weapons are used for chopping the heads off of a demon when one gets out of line. How the heck Hindus can remember all of these gods and the multitude of myths and stories about them is beyond me. It seems like a lot of work! The three main gods are Brahma, the creator, Vishnu, the sustainer, and Shiva, the destroyer. (The three are often referenced as a shorthand for the word GOD — Generator, Operator and Destroyer.) All three gods have several names and appear in many forms, or incarnations. Ganesha is probably my favorite Hindu god — and I’m not alone on that. The half-elephant-half-man god is a favorite of many. Ganesha is always the first God that you pray to when embarking on something new, such as a new job or school or trip. He is the remover of obstacles, and his mode of transportation is on the back of a mouse. 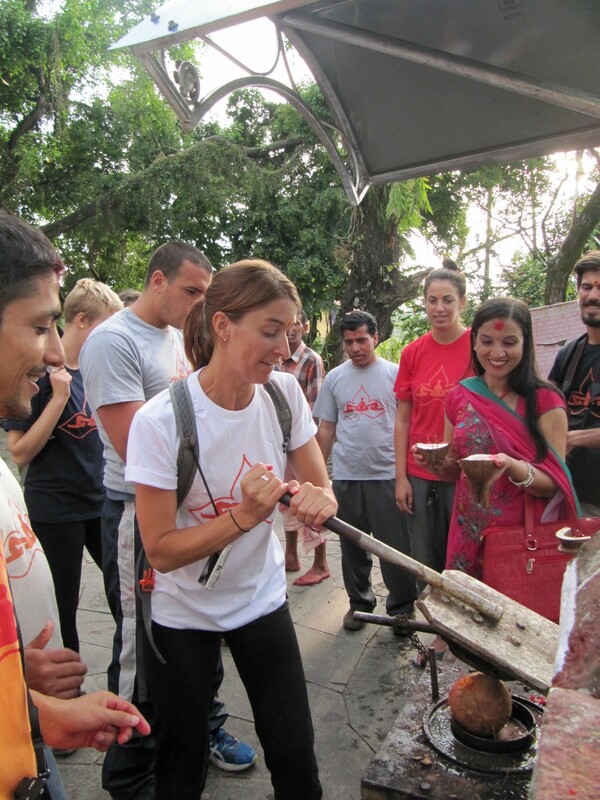 After visiting what seemed like hundreds of temples over a few weeks in India, we became pros. The first sign that you are close by a temple: You will you see many vendors lining the road selling flowers, orange garlands, incense, and little baskets of offerings. At the famous temples that draw big crowds, you will also find women and children sitting along the paths waiting to watch over your shoes. You will pay a few rupees to check your shoes and they give you a number. The fun part comes once your shoes are off, then you must hop barefoot across the scorching hot stone and marble tiles to reach the temple. 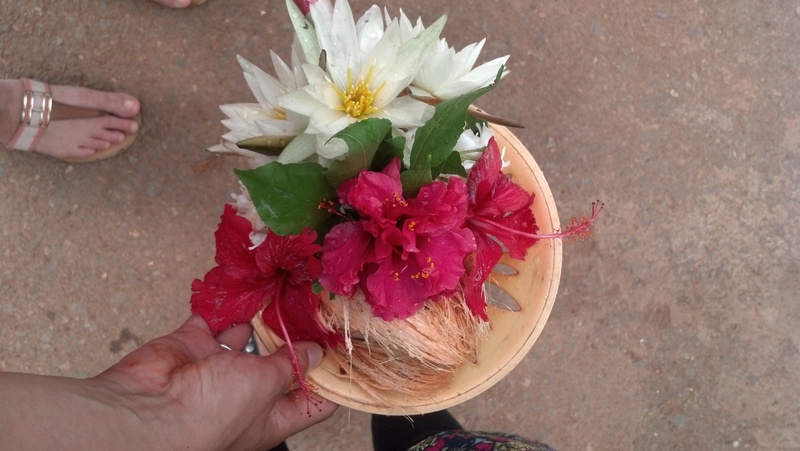 When outside, you buy a little basket filled with flowers, herbs, half a coconut and other offerings, to get blessed at the shrine. The priest will put water in your hand, which you are supposed to take a tiny sip of, and then pour the rest over your head. When the priest returns your basket, he will also hand you a lotus flower and a few little pieces of candy, which you are to share with your family. The Mother Temple of Besakih, the biggest and most important Hindu temple in Bali. There is often a big bell at the entrance of a temple. 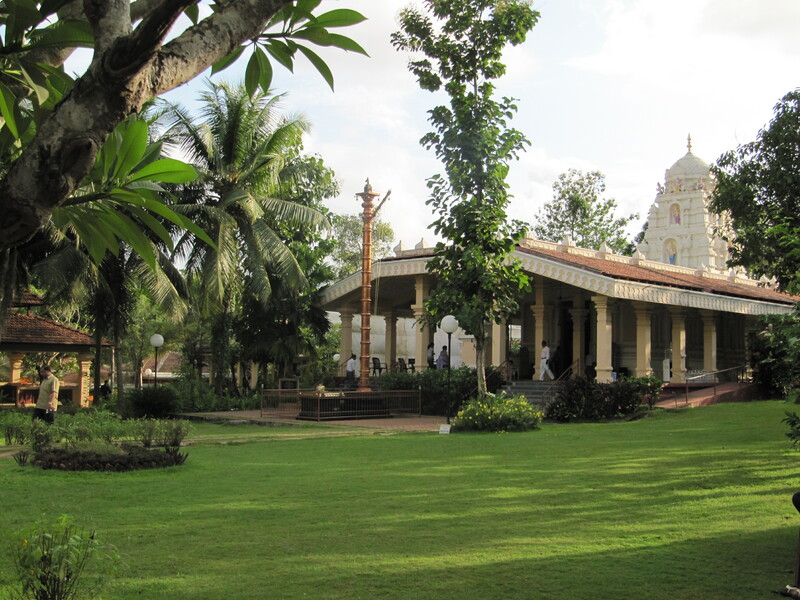 Hindus will ring the bell as they enter to awaken the god and let them know of their presence. There are times of the day when the idol, or statue representing a certain god, is covered with a cloth or turned around — this is when the god is sleeping or eating and priests will not perform blessings at this time. You will often see Hindus touch the floor of the doorway when they enter a temple in respect, and some will even walk out backwards when the leave, as to never turn their back on the god. Utilizing the coconut-chopping station at a temple in Pokhara, Nepal. Outside the main temple at Mahalaxmi in Bombay, I noticed curious a sign that said ‘Please do not break your coconuts here.’ We asked what that meant, it turns out many Hindus break coconuts as a sacrifice to the gods. This is in place of sacrificing a sheep or goat, as many don’t believe in harming animals. This temple prohibits guests from breaking their coconuts inside, as a way to preserve the nice marble from being cracked. Once the coconut is blessed, the family brings it home and uses the coconut meat as an ingredient in their next few meals. At the temple on Fewa Lake in Pokhara, Nepal, there was a designated coconut-chopping machine located at the side of the main temple. Here, we were able to chop the coconuts we brought on site and share the water and meat amongst our group. While most of Indonesia is Muslim, Bali is a Hindu state. The Balinese have their own customs and ways of celebrating Hinduism that was a little different from what we saw in India. Balinese people create hundreds of these small bamboo boxes every single day and fill them with offerings to the gods. Usually flowers and incense and maybe little treats. The boxes are scattered everywhere around Bali: outside any business or hotel or house, at temples and shrines, in cars, and even seemingly random places in the woods or on an otherise empty sidewalk. It’s for good luck and blessing, showing respect to the gods. 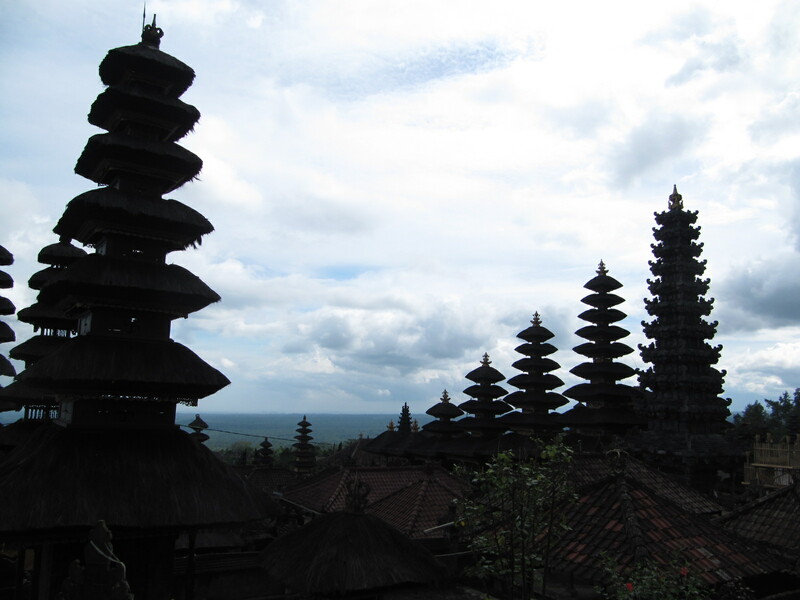 I found it beautiful how Balinese people easily intertwined their religion into their everyday lives. They start the day with prayers and blessings and everywhere you go there is tangible evidence of their devotion. Though known as being the birthplace of Buddha, the population of Nepal is 80% Hindu. Over the next 2 weeks in October, Hindus will be celebrating the Dashain festival, and schools will be closed. This is the biggest holiday in Nepal. I learned all about Dashain at the Deeya Shree school in Lokanthali, outside of Kathmandu, where I’ve been volunteering for the past week. According to an 8-year-old student, this is what happens for Dashain: “We go to my grandmothers house, and my grandfather gives me a teeka, and then we get money and presents.” How much money do you get? I asked, naturally. “LOTS of money! Like, 300 rupees.” That is equal to $3 USD. Happy Vijaya Dashami! 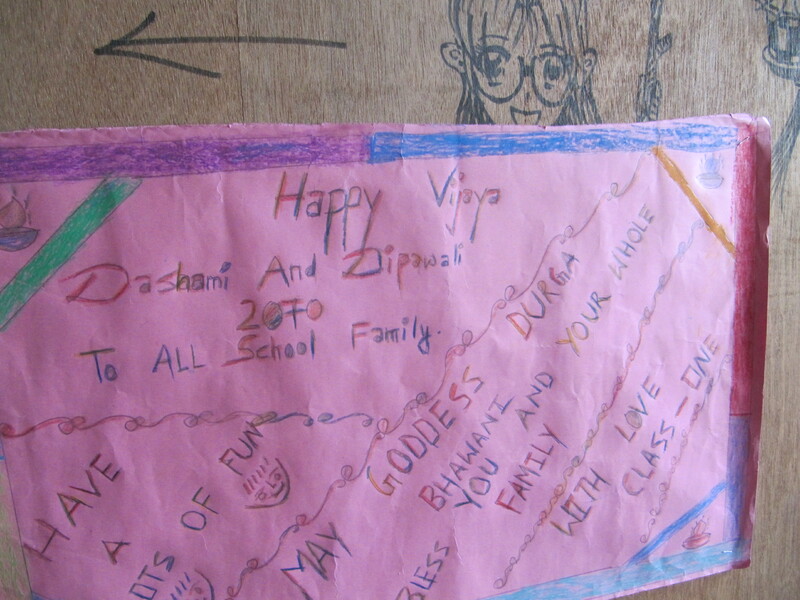 A poster made by students at the school. A teeka is the red circle you see on the forehead of many people in Nepal, and the eldest member of the family applies it to the younger ones. Red represents strength and power. Dashain is celebrated to worship Durga, the mother of the universe and goddess of protection. The focus of the holiday is on family togetherness. The 10th day of Dashain is Vijaya Dashami, one of the most important days of the year. I’m excited to be in Nepal at such a special time of year, and looking forward to watching the festival unfold over the next few weeks. I’ve learned much about Hinduism in my travels — I can even sing several Sanskrit mantras that I learned at Yoga school — but it is such a rich and deep culture, I think in reality I’ve probably just scratched the surface. Next Post Bukit Lawang: Must Love Orang-Utans. And Rustic Jungle Jams. Fascinating! I look forward to visiting a few temples when we go to India. I hope you can educate me more, after you experience the Hindu holidays in Nepal. So nice to read ur experiences n travelouge. Hinduism is more like a philosophy. keep it on Michelle. Dashain celebrations will leave schools n streets empty for few days because it is a sort of national festival for Nepalese. Pls keep on writing. I utterly loved your post. Also, it was a commendable job to describe and put forth the intricate yet simple Hindu rituals. Cheers! I see you don’t use the power of social websites like FB on your website.